A full description of how the BVIT detector operates can be found in Siegmund et al. (2008). 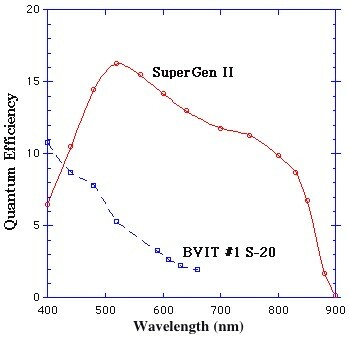 The current BVIT detector (installed on the SALT in November 2012) has a Super Gen II photocathode whose detection quantum efficiency is ~ 5 times greater than that of the previous S-20 photocathode of the proto-type detector initially mounted on SALT in 2010 (see below). The BVIT instrument consists of a photon counting image tube detector, a shutter/iris, a pair of filter wheels (containing selectable ND and B,V, R and H-alpha filters) and command and control electronics (consisting of amplifiers, low and high voltage power supplies, an FPGA data processor and a ground support PC. 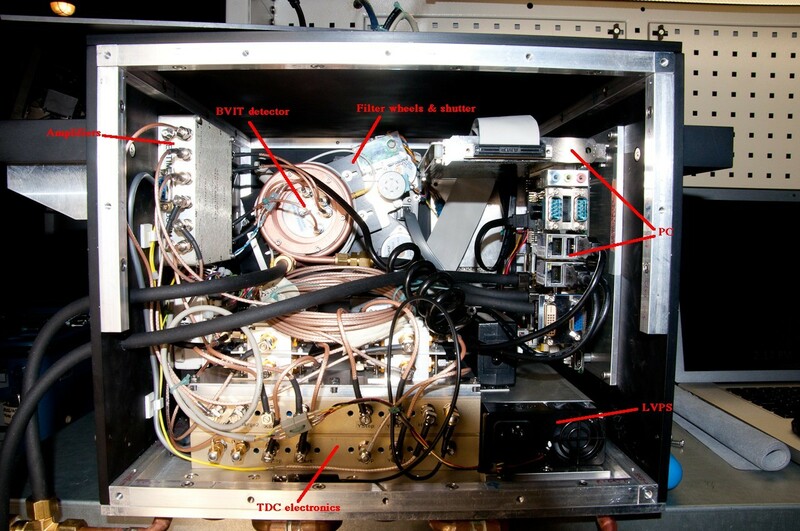 The detector is cooled using heat sinks and a glycol cooling line to obtain operational temperatures in the 10C to 30C range (dependent on the time of year). Note: These are source count rates detected over a 9 arc sec sq. area on the detector (i.e. typical “seeing area” of a source). The sky background over the same area for a “grey” lunar age is typically 960 cts/ sec (B-band) and 1500 cts/sec (R-band). When integrated over the whole area of the detector the respective total sky background rates are 1,100,000 cts/ sec and 1,700,000 cts /sec. Thus, the sky background normally limits the allowable total count rate for BVIT and the source limits the allowable local count rate. Use of the ND filters is normally required for sources brighter than 14th magnitude. full moon). Also, the detector should NOT be operated at temperatures > 35C. The glycol cooling should take care of this.